Have you ever wondered how long it takes from dreaming of a trip to experiencing one? According to Google research, just two steps – or micro-moments – planning and booking. And a booking app turns this dream into reality in no time at all! Travel & hospitality industry is growing fast, propelled by healthy economic indicators in most countries, demand for corporate travel and a shift towards experience economy. And the market consumer behavior has gravitated towards online booking. In US alone, 88% residents prefer using an online channel to book a hotel. Booking a stay via a mobile app has become easy, quick, and enjoyable. And building a hotel booking app has never been more affordable and rewarding. 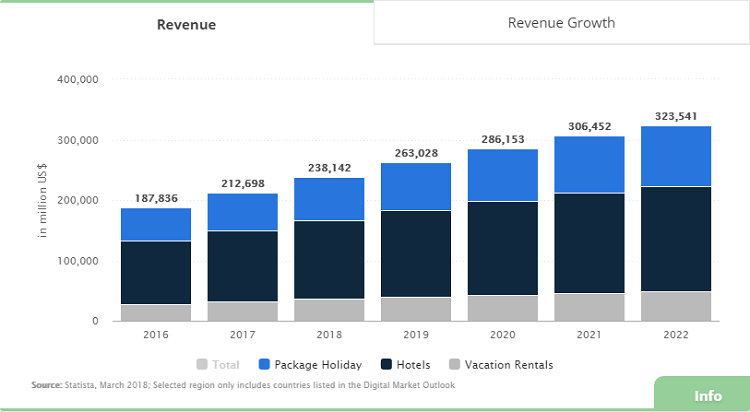 The worldwide market volume for online hotel bookings is estimated to exceed $174 million in 2022. 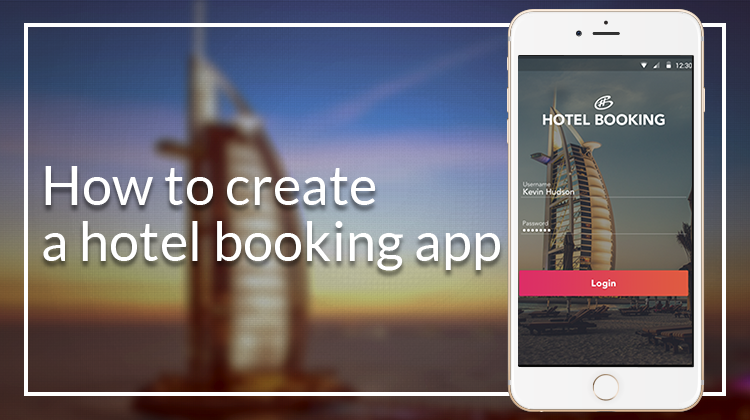 In case you’ve always dreamed but had no clue to creating a hotel booking application, we’ll unveil some secrets of hotel booking technology. Convenience – saves you tons of time net surfing, talking to agents, phoning hotels, etc. Security – a user’s privacy and financial information is protected. Cost-effectiveness – allows to spot deals and take advantage of loyalty programs. Clearly, hotel reservation is at the heart of a hotel booking app, but there’s more. With most apps, you can book a flight, a taxi, a restaurant, a package holiday, or a cruise; discover new travel destinations or places to see nearby, learn insider’s secrets, read travelers’ reviews and stories, and whatnot! So it’s small wonder that thinking of a hotel booking app, you actually imagine a travel app. Travelers use a wide variety of apps throughout a journey. But a booking app is where you begin your user journey, since your pre-trip activity revolves around searching / booking flights and accommodation for a stay. Apps like Booking.com or Hotels.com give you plenty of choice in any direction you’re looking. Not every travel app is designed for booking. Google Trips is a powerful trip planning tool. And it’s perfect for keeping all your bookings in one place. But you can’t book your stay with it. A reminder: the apps above have nothing to do with hotel booking. Though, it’s up to you whether you want your booking app to stop at booking or follow through the whole travel cycle. What counts is how it meets its primary purpose. Travelers definitely look for the cheapest accommodation, and hotel metasearch engines meet this demand. Apps like TripAdvisor, Trivago, Google Hotel Finder, Kayak, Hipmunk, or Skyscanner show price comparison across various sites. What most of them don’t have, however, is a booking feature. By redirecting you to a hotel website where you can actually book your stay, they get a referral commission or CPC charge. (Sort of a modern Robin Hood, pinching off online travel agencies and returning to hoteliers). Some of those metasearch engines have now added booking functionality of their own (e.g., TripAdvisor, Google Hotel Finder). We will refer those to a hotel booking aggregator category below. Not all travel situations are anticipated through the ‘pre-trip – in-destination’ opposition. Sometimes last-minute alterations are inevitable or the ‘in-destination’ activity may involve rebooking. Millennials are increasingly prone to putting off hotel reservations till later, hoping for last-minute deals. And they’re right, you know! Nearly a third of hotel inventory is never booked. This sweet USP of last-minute booking apps (HotelTonight, HotelQuickly, Hipmunk) is music to an adventure traveler’s ears. What does an online hospitality market look like? Hospitality industry is becoming a tougher place. There’s a cut-throat competition of incumbents (hotel/hotel chain owners), travel agencies (increasingly turning OTAs), non-traditional entrants (Airbnb), and tech entrepreneurs looking to create aggregator sites and mobile apps, all hoping to have their share in the growing market. In close-up, the market is shared by three categories of product owners. Online travel agency (OTA) – a website/mobile app that offers more than just hotel search and booking (e.g., car rental, flights, etc.). If fact, they mostly focus on packages. Major players are Travelocity, Expedia, Orbitz, Priceline. Hotel booking aggregator sites – these are metasearch engines whose primary business is hotel data aggregation and booking. Here belong TripAdvisor, Google Hotel Finder, Hotels.com, PlacetoStay, HotelTonight. Hotel chain websites – web & mobile applications specifically for a hotel chain, like Hilton, Marriott, Hyatt, Starwood Hotels & Resorts, The Ritz-Carlton. Key market players are constantly challenged by newcomers with unique value propositions (UVP) and better business models. Niche market solutions range from fairly seasoned products, like Airbnb, to newcomers, like Holiday Swap. These products are evolving and it’s not long before we see some change in the market share ratio. Last-minute booking. This is a growing trend, since thrifty travelers love deals. Aindroid and iOS reservation apps HotelTonight, HotelQuickly (the Asia-Pacific region), One Night are among the ones to offer deals on same-night bookings. Low-cost booking. Millennials don’t give a hoot to where they will fall dead tired after a day’s adventure. So long as there’s a good company and plenty to do, it’s the place. HostelBookers and HostelWorld are the apps to cater to nomadic style travelers. Another booking app, an extension of a travelogue LonelyPlanet, offers hostels and hotels for backpackers and low-cost travelers. Room sharing. Airbnb, already a renowned player on the market, stands out from the crowd for its unique business model, mass-market targeting, and global coverage. The prospect of sharing a room with a complete stranger may have sounded creepy ten years back, but those with adventure spirit couldn’t care less. Getting personalized travel experiences in most of the metropolitan areas worldwide with a pretty slim wallet – what a UVP! Swapping homes. Holiday Swap, dubbed ‘travel Tinder’, lets people swap homes for $1 a night. Swiping through homes, a user chooses one to their liking. $1-per-bed-a-night cost sounds too irresistible for a wanderlust budget traveller not to try it. The app currently covers 40 countries across 6 continents. Peer-to-peer model is a surefire way to success. Free stay. The Couchsurfing app provides free accommodation and meetup with nearby locals. The app is all about culture, exchange and friendship. Over 12 million travel enthusiasts use Couchsurfing in more than 230,000 cities around the world. Ultra-short stays. Booking hotel rooms for the day rather than the evening hours is ideal if you need to venture out into the night. Instead of staying in a no-man’s land, relax, take a shower, or just get some work done before your night flight. That’s a UVP of Dayuse.com. Rooms are generally cheaper, and the stay often comes with access to all the same amenities enjoyed by overnight guests. Check out how CodeTiburon helped develop a space-sharing app to marry Airbnb and Tinder Social business models. As a hotel owner, attracting direct bookings is essential as you can sell at higher rates. Delegate the entire process of the app creation (research & ideation, business analysis and UX, design & prototyping, development and testing) to a software development company. Understand the basics of the process and take more informed decisions at various stages of your app creation. Want to know more? Here’s some food for thought. Dig in. Arrange the features to help them achieve the goal. A different procedure is with last-minute bookings. If a user searches in the locality, let them hit ‘Find hotels near me’ and use GPS navigation. This leads us to a screen with search results. Tip: By integrating a two-step, mobile-friendly, online booking engine you can ensure guests are able to easily search available rooms, rates and dates. A user sees hotel listings that match the initial parameters. The rating and price for rooms will help choose. With too many options, filters and sorting will do further refinement. Filters allow us to additionally specify our preferences (like budget, review score, proximity, reservation policy, etc.). That will trim the list. Sorting doesn’t shorten the list, but prioritizes it. For instance, we can choose to view cheaper options first. Another cool feature to have is an in-app map. Users can pick location based on its proximity to the sights they plan to visit. Showing room prices or user ratings right on the map makes it easier to make an optimal choice in a desired location. Overview – basic hotel information (address, check-in/check-out time, etc.). Photo gallery – a visual representation of the place. Accommodation offers – availability details, room photos, descriptions and per-day cost. Additional amenities – some niceties to have on a stay (Wi-Fi, A/C, parking). Review score – a bar of guest reviews and average score. Map – hotel location and surroundings. Suggestions – other matching options, information about restaurants or places of interest. Social media buttons – for sharing an offer with friends. Room status – real-time indication of room availability (availability calendar is a great visual depiction) and ‘last booking’ time. A payment gate completes your booking funnel. It leads a user through an easy and safe transaction via your app. Most apps provide an opt-out for a user to pay at the check-in. This is a sign of quality application. In case a user is willing to advance some sum, offer several payment options (credit card, PayPal). Hit the button. Voila! The ultimate goal is achieved. Provide an automatic printable booking confirmation that includes payment details (a total sum, and payment by a night). Tip: Enhance your guests’ experience and increase incremental revenue by offering ‘extras’ the smart way – at the time of booking. This is optional at the start. But once booking is done or if a user returns, registration comes with extra benefits, as it allows to track user activity and provide personalized insider information. Registration may be accomplished via your website, Facebook account or email. This is important as you want to see your users coming back. It stores information about a user and their booking history, allows to create wish-lists, choose a language, currency and more. It’s a place for personalized offers and discounts based on the data collected from the profile. Most hotel booking sites practice free cancellation policy extending up until the last day. This policy is attractive to users, practically a deal-breaker. It’s good to know you can always change your mind (free of charge) and rebook till the last 24 hours. But it can cause complications to OTAs and hotel owners, since most cancellations are done a day or two before the due date. And so the occupancy data is hugely inflated. Luckily, most hoteliers have an anti-cancellation strategy in place. While core functionality is a must, other features are not necessarily bells and whistles. Even though flight and hotel booking is just one milestone in an entire user journey, make it a remarkable and memorable one. After all, today’s travel is about creating unique user experiences throughout the journey. How would you keep your users engaged once the bookings are done? Deloitte stresses the need to explore the power of adjacent spaces. Many travelers would prefer to have a one-stop app for planning, booking, and in-destination navigation. Nice-to-have features are about pre- and post-booking customer satisfaction. Similarly to personalized recommendations on Netflix and YouTube, online hotel booking providers tailor recommendation based on users’ previous searches. For example, Booking.com offers alternative destinations, while TripAdvisor has added ‘Just for You’ personalized hotel recommendations. You may also offer alternative dates or routes, airfare and car rental deals, local events and attractions. As more personal data is accrued, the algorithm can produce tremendous results. As travelers, we won’t settle for less than the best deal. But flight and hotel costs fluctuate a lot and so we can’t be sure. Or wait… We can! With abundant historic data out there, it’s no longer a problem to build an algo taking account of seasonal trends, demand growth, airlines’ special offers, and deals. Hopper employs predictive analytics to help users book cheaper flights and (recently) hotel rooms, just like Kayak. With advance in the area of AI, smart concierge services are gaining momentum. Chatbots provide better customer experience by being out there 24/7 and help travelers navigate through most common issues. But it’s also a great marketing tool to reach out to your audience via social networking sites. That’s how Marriott engages with its customers on FB Messenger, Slack, WeChat, and Google Assistant. In fact, travel bots provide a variety of services – from search and booking to an entire trip management and companionship. Imagine situations outside of your control when something goes wrong, like a flight is cancelled or delayed and the situation asks for immediate change of plans. In business travel, the repercussions can be considerable. In any case, what you need is on-the-spot orchestration. That’s a complex solution starting with spotting potential disruptions based on weather, current delays, and other airport service data; moving onto suggesting a contingency plan and even executing it. This is not a user-facing feature, but a most useful one in the travel industry. Dynamic pricing is an important part of revenue management. It offers variable room rates based on demand and supply. This allows hotels to quickly react to changing market values maximizing revenue and occupancy rates. The practice of changing room prices as often as twice a day isn’t new with hotels. But its traditional implementation based on capacity controls/quantity decisions deprives hotels of much of their revenue. Surge pricing algos can increase the revenue twofold at least. For example, Starwood hotels have been using a ML tool that taps into hundreds of factors. And the benefit is evident. How else would you win the battle with so many aggregator booking sites if not by cheaper direct offers? There’s a variety of ways to show your users around – still and 360 photos, immersive videos, and virtual tours. Hopper has introduced a feature called Hotel Profiles, which works like Snapchat or Instagram stories, combining static photos with showing different sections of the hotel dynamically. Adjusting language and currency based on customer location is easy and thoughtful, part of a personalization strategy. The value of this feature can’t be overrated since 95% of leisure travelers read at least seven reviews before booking their holidays. Once the booking is accomplished, a user will need a confirmation. An automatically constructed online receipt is then sent to user email or mobile. That will also help keep all the info on bookings at hand. The practice of issuing brochures is not new. What’s new, however, is adding a layer of augmented reality to your hotel booking app. An AR hotel brochure is a winning marketing tactic that has your audience engaged by its novelty. If you aren’t on first-name terms with the technology, here’s how to harness AR for your business benefit. Push notifications and alerts lighten the life of a traveler throughout the journey. You can notify your user in a variety of situations. Suggest the best value options, alternative routes, changes in rates, special offers, scheduled activities, travel plan notes. Use numbered badges to indicate incoming messages or booking reminders. Despite the fact that today’s consumers are spoilt for choice when it comes to online booking, using third-party aggregator sites can be deemed risky. How accurate can that be? Should I opt for direct reservation to avoid overbooking or information loss? These worries have little foundation. And here’s why. At the core of any online hotel business is a booking engine. It ensures data accessibility. But its primary role is syncing the data across various distribution channels. So the booking engine always has real-time information about all the rooms available. The booking engine is integrated with all online distribution channels. It doesn’t matter if you book directly from the hotel site, via OTA / aggregator site – or off-line (in the hotel’s physical office). Each of those scenarios envisages an update in the booking engine. Let’s look under the hood to see what happens once you book a hotel. Step 1. A user books a room online or offline. In the case of offline reservation, a hotel booking manager will use the back office to add the customer data online. In online booking, user data is transferred to the booking engine via the internet. Step 2. Room availability is updated instantaneously across all channels. It excludes the risk of overbooking and information loss. A user’s credit card information guarantees the transaction according to the site’s booking policy. Step 3. Automatic confirmation email is sent. Its purpose is to reassure the guests that the reservation was successful. Once a customer finalizes their reservation and the availability has been updated through the channel manager, an automatic confirmation email is sent to the guest with the information they need regarding their booking. Step 4. Review requests and promo codes are sent. After the guest’s check-out, an automatic email will be sent in order to encourage them to leave a review on a hotel’s website, social networking pages and popular online travel review sites. You may believe that all this data syncing across various databases is an insurmountable task. But it’s easier than you think. We’ll use the power of APIs and XML. Your app’s fast and accurate response is a game-changer in closing a deal. The dynamics would be impossible without APIs and XML. In short, they provide you with real-time information on room availability, pricing, and amenities. XML integration binds different formats and programming languages together, facilitating the flow of user requests and end server responses, so users can get information from hotel providers, car rentals, airlines, railway companies, restaurants and more. APIs provide a legitimate way for one company to access the products of another (as opposed to scraping). They bridge the information flow across the connected supply chain – providing the consumer with a variety of options. Hotel meta search data. HotelsCombined Data Feeds and Skyscanner Affiliate API provide price comparison and more. Hotel search and booking. Pull the hotel listings and the offers via aggregator APIs like ZUMATA Hotel Booking API or Expedia Affiliate Network API. Ratings and reviews. Get dynamic access to reviews and ratings via Olery Hotel Review Data API and TripAdvisor Content API. Places nearby. Use Google Places API to provide users with information about stores, cafeterias and other places of interest in the vicinity of their hotel. City guides. Users love reading stories and guides before deciding where to go. izi.TRAVEL provides you with an API to cater to this whim. Stories about over 1750 cities in various languages will adorn the services your app provides. Maps. Nothing can beat Google Maps API at map integration. You’ll definitely need those. Factual Data API provides data on over 65 million local businesses and points of interests. Check ViaMichelin REST API and SmartyStreets Address API for maps, address validation, routing and geocoding. Weather forecasts. OpenWeatherMap API does the job. Uber integration. Uber API is best for taxi rentals. In-app payments. Stripe or Braintree SDK will help integrate a payment system into your app. GDS access. 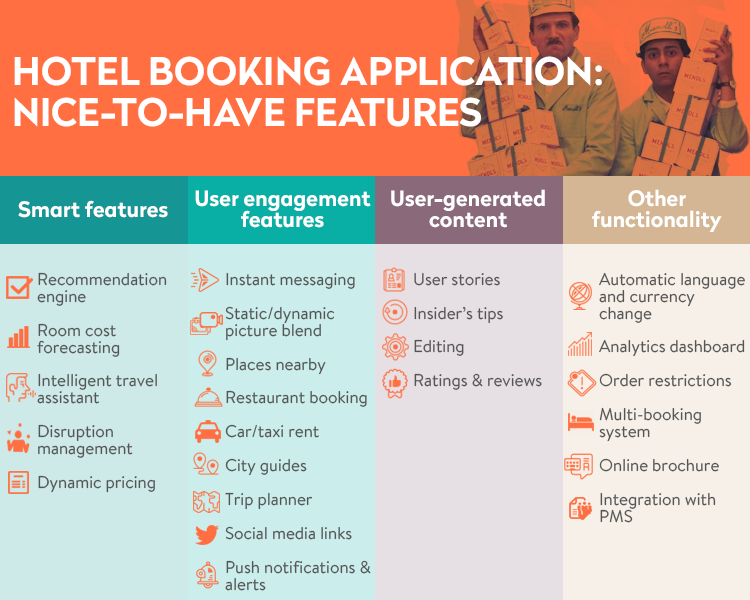 Online hotel booking platforms will benefit from automating their efforts of content fill and update via Hotel APIs integration. A hotel owner will get worldwide exposure via a GDS like Amadeus, Sabre, or Travelport. The General Data Protection Regulation (GDPR) (EU) 2016/679 has put European citizens and residents back in control of their personal data. But is it possible at all? According to the American Hotel & Lodging Association, about 55 million online hotel booking scams occur every year and it is an amazing place for cyber criminals to take advantage. Secure your app’s code from the ground up. Algorithmic code encryption together with API encryption is best practice. Scan the source code regularly to spot vulnerabilities. Relying on the app store’s approval is not enough. Secure your network connections on the back end. Penetration testing will diagnose how secure the servers are. Use containerization, encrypt database and VPN, SSL, and TLS connections. Put identification, authentication, and authorization measures in place. OAuth2 is the industry’s golden standard for secure connections via user-specific, one-time tokens. JSON web tokens are a lightweight solution for mobile security. Ensure customer data safety and implement a good mobile encryption policy. An app design should prevent storing user sensitive data on the device. The Appcelerator platform offers an encrypted SQLite module so data stored locally is safe. Have a solid API security strategy in place. API’s are the chief passageway of content, functionality, and data, so ensuring proper API security is an important part of the chain. Hotel aggregator sites that provide APIs pull their data via a variety of other 3rd party tools. So it’s worth checking how secure the top hotel metasearch engines are. Test. Test. Test. Testing is not inferior to development and so should be given proper attention. Check network weaknesses with penetration tests; take thorough control of authentication and authorization, data security issues, and session management. Needless to say, online- and mobile-all are the new standards of the travel & hospitality industry. And tech innovations galore are reshaping the market. Very often just one decision determines whether you’re part of the future or a thing of the past. Let this decision be smart and well-thought out. Share your ideas of a hotel reservation application with us. How much does it cost to build a hotel booking application with CodeTiburon? Did you enjoy the read? Was it useful? Your sentiment helps us to create better content. Use the reactions to assess the article. Or leave us a note in the comments. We are out here to boost your tech savvy.